Here is the second download DVD with routines using the four Aces as primary 'characters.' 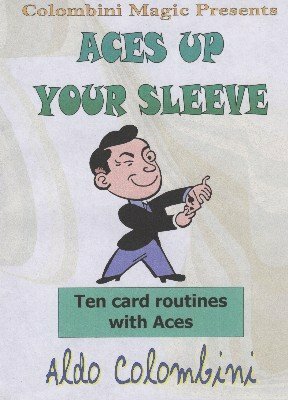 Ten card routines with Aces. TOPSY-TURVY ACE LOCATION (Nick Trost): In a face-up and face-down shuffled deck you find the Aces and then all the cards turn facing the same way. HOF-WICH (Cameron Francis): Two Jokers find the Ace of the same suit of the selected card and then the Ace changes into the selection. ACCENTUATED ACES (Paul Gordon): The Aces are eliminated one by one and the last changes into the selected card. ATLANTIS (Aldo Colombini): A card is placed on the table and a selected card is inserted among the four Aces. The Aces change places and the card placed on the table turns out to be the actual selection. ILLUSION VS REALITY (Peter Duffie): A production of the four Aces where two of the Aces appear in the spectator's hands. PROXIMITY (Aldo Colombini): Three cards are selected. You show three other cards and these are seen to be of the same value as the selections and finally the four Aces appear. PASSING THE HAT (Aldo Colombini): A card is selected. You produce the four Kings, which capture three cards. The selection is seen to be an Ace and the three cards between the Kings are the other Aces. SUGAR AND SPICE (J. K. Hartman): Great routine where you produce the Kings, then the Aces and finally a royal flush. INTERNAL AFFAIRS (Aldo Colombini): The four Aces change into the four Kings and then reappear face up in the middle of the deck. WELL DONE, BOYS! (Aldo Colombini): The spectator cuts the deck at random and first finds the four Kings and then the four Aces.